When do we see lasers in action? Well, most of the time, lasers are depicted in science fiction movies sometime in the far off future, where mankind has explored the galaxies far and wide, bringing along with them their sense of adventure and warfare (it is inevitable, as the entire universe is atrophying, so resisting conflict would be futile), and in a case of self-defense (or offense for some), a quick laser shot would do the trick nicely. Star Trek has their phasers, while the X-Wings in the Star Wars universe will see lasers shot from the tips of the S-Foils. The thing is, when will such high tech warfare and weaponry arrive on planet earth? 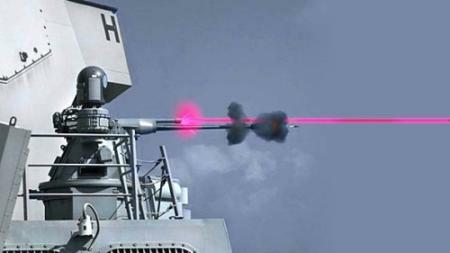 It seems that the answer is “in the right here and now”, where the US Navy has already received its very own kind of laser cannon that has made short work of drones bobbing away in a distance, and said laser cannons can be fitted to active warships. The US Navy will obviously start to fit their own ships that sail the seven seas with lasers, touting that this represents the future of warfare. Also known as the Laser Weapon System or Laws for short, it has seen action in testing areas, shooting down drones, and considering how it relies on electricity to fire, it costs under $1 per shot – which should be as efficient in disabling a small vessel on the sea, and when you compare it to a $475,000 Sidewinder missile, it makes a whole lot more economical sense to implement Laws throughout their fleet, no? Interestingly enough, the prototype is not expensive either, where it costs less than $40 million to make, which is a drop in the ocean that the US call their defense budget. It will be installed aboard the USS Ponce, where said vessel has been assigned to the status of a floating base in the Middle East, although this is set to happen sometime after October this year. The Navy has hope that incoming missiles will be unable to outmanoeuvre a highly accurate laser beam that is fired at the speed of light, and for the controller, this could very well be a video game of sorts, although real lives are at stake.